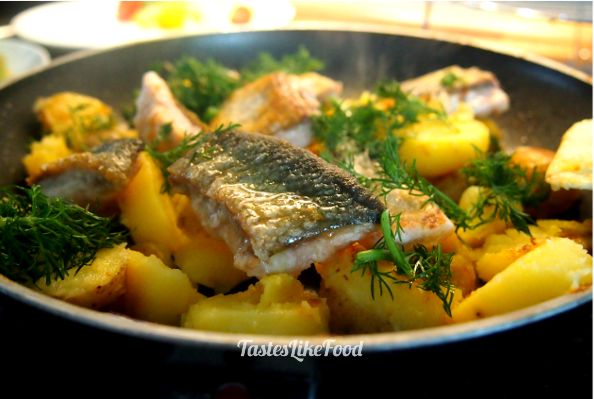 Tyrolean Arctic char will forever remind me of Germany – a food kingdom of sausages, white asparagus and potatoes. As a very moderate fan of the first two, sometimes I have some down-to-earth cravings for potatoes. Boiled, cooked on vapor, baked, mashed, roasted, fried… You probably have your favorite way of having your potatoes done. Tyrolean Arctic char goes perfectly with the fried ones. If you can’t get it, as getting a particular fresh fish far from the seaside might sometimes be a real challenge, the dish will go equally well with pollack, sprat or salmon. You can serve it with any green salad you like eg. with the summer salad with raspberries and egg. Cook potatoes and slice them to the desired thickness. Slice the fish fillets into strips and coat them with flower and salt. Melt 2 table spoons of butter over medium low heat in a non-stick frying pan. Fry the fish until it gets gold-brown and put aside on a paper kitchen towel or baking paper in order to remove the excess of butter. Fry the onion rings on the same pan for 2min. Add sliced potatoes and fry together with onion for another 2min. Finally, add the fish again and fry for 2-3min. Add a pinch of salt and black pepper. In a small saucepan melt 1 table spoon of butter and mix with the fresh lemon juice. Pour it over the fish and potatoes. Season with fresh dill and serve with a green salad.